So you have a beautiful piece of art that you wish to burn at Burning Man. How do you practice Leave No Trace (LNT) and protect the playa from heat damage? Burning anything directly on the surface of the playa will create Burn Scars, which are patches of discolored, hardened playa sediment, caused by the heat and smoke of carelessly constructed bonfires. They are difficult to clean up and take years to recover. Burn Scars, like the one to the left, are one of the issues that the Bureau of Land Management (BLM) watches closely in their role as stewards of public land. Burning Man’s ability to return to the Black Rock Desert year after year is directly dependent upon our ability to Leave No Trace. It is also your responsibility as a citizen of Black Rock City to Leave No Trace during your time here. This choice is the simplest; you can either dismantle your artwork, or carry it in one piece if you have enough people, and place it in one of the Community Burn Gardens. Burn Gardens are located on the open playa side of the Esplanade at the terminus of the 3:00, 6:00 and 9:00 streets. It is best to dismantle your art and place it in the burn cauldrons. The height of the cauldrons will most likely be over your head and ablaze, so exercise due care when loading your artwork. Note: Do not add any liquid fuel to the Burn Gardens as they are metal cauldrons standing about five feet tall; the flash-over from adding liquid fuel to an unseen fire down inside the cauldron makes it too dangerous to attempt. You can also burn your art on the ashes of the Man Saturday night after the Man has fallen, and after the crowd dies down. Please make sure your crew is safe and that the piece is placed completely over the DG so none of your work extends onto the unprotected playa and scorches it. If you decide to burn on the Man’s ashes please be careful; there are many hearty participants who like to sift through the ash and rubble to find melted pieces of the Man’s neon. It’s important to make sure your installation does not pose any additional safety risk to participants. Closer look at inadequate burn platform. If you wish to burn your art directly on the playa you have options available to protect the playa from direct and radiant heat to prevent burn scars. With some clever thinking, preparation and intelligent use of materials, this can be made to fit in with the aesthetics of the installation. 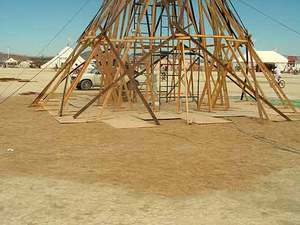 As you plan for the burning of your art on the playa and the prevention of burn scars there are some aspects that must be paid attention to in order to prevent worst case scenarios like the inadequate burn platform to the right. What kind of damage can flaming art do to the playa? Plenty. 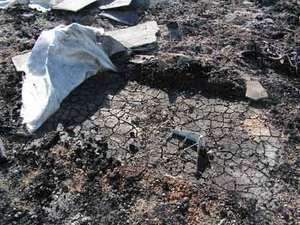 The playa hardens and discolors when exposed to fire. This difference in hardness from the surrounding playa when exposed to weathering creates raised areas, allowing dunes to form. Dunes are a hazard for vehicles and affect the landscape in undesired ways. When designing a simple Burn Shield the following aspects must be taken into consideration: overall weight of the art, whether participants will be walking on the artwork, heavy falling portions of the artwork staying on the Burn Shield and not allowing it to penetrate or damage the platform. 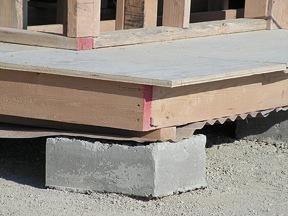 Sharp edges and tripping hazards are all factors to consider when choosing materials. 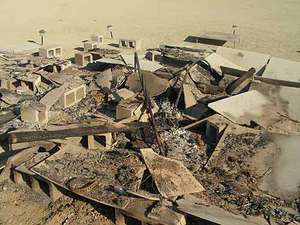 Debris must be prevented from falling onto the playa surface such as ashes, wood chips, nails etc. that can and will settle into cracks in the playa surface. These materials can be very difficult to clean; even smoke stains can be challenging to remove and are best dealt with by prevention. The Burn Shield should be designed in such a way as to extend beyond the width of the artwork and catch any flaming debris that may fall, as well as catch the artwork should it fall to one side. Additional Burn Shield materials can be added prior to the burning of your art to accommodate this. One of the key aspects of your Burn Scar Prevention plan should always be cleaning up as quickly as possible after the burn, disposing of all materials and debris from the playa before wind and other weather conditions spread ash and other debris. An aspect of the clean-up that is sometimes missed is clean-up of any MOOP (Matter Out Of Place) left from participants who have come to watch the burning of your piece. A sweep of the area for cigarette butts and other trash is a must post-burn. As an artist burning your installation you will be responsible for an area of approximately 50 feet or more past your perimeter. A member of FAST will work with you to identify your complete area of responsibility. A Burn Shield is defined as something that separates and insulates the playa from heat and smoke of a burn. The key to Burn Scar Prevention is making sure that your Burn Shield is designed to protect the playa. Over the last few years Burning Man has studied the successes and failures of numerous Burn Shield designs. After much trial and error we have identified some systems that have proven effective in preventing both baking and discoloration of the playa surface. There are two different approaches to this that we have found work best. Burn Platform Designs, like the example to the left, work best for artworks that are smaller and lighter and will not be supporting the weight of participants climbing or walking. The idea with this design is to create a separation of at least six inches or more from the playa to the bottom of the burn shield, and have it designed to support the weight of the artwork. This type of design is usually constructed of flat or corrugated steel sheeting supported by and securely fastened to either steel legs or cinder blocks. A key factor in a successful design of this type is not to have any wood or other materials below or hanging over the steel sheeting as these will be set ablaze from the radiant heat, defeating the shielding effect of the steel. If the Burn Platform material is flimsy there is the potential of everything collapsing onto the playa, defeating the purpose of Burn Shield. Building a Burn Shield that both protects the playa and supports the weight and movement of participants is a greater challenge. Burning Man has discovered that a layer of Decomposed Granite (DG) placed between the surface of the playa and pre-construction of the artwork, like the example to the right, will provide an insulating layer protecting the playa from heat as well as providing the needed support for larger artwork. Care must be taken not to leave any exposed areas and to protect the DG from being scattered by participants. No matter what kind of protection you think you will use for burning your artwork, The Fire Art Safety Team (FAST) is here to help discuss your Open Fire Burn Shield Designs. Arrangements for the purchase of Decomposed Granite are made through Burning Man and a deposit will be required pre-event to insure its clean-up and removal. Please contact us at fire-art@burningman.org with any questions. Corrugated steel needs supports no more than two (2) feet (0.6m) apart to support the weight of walkers or heavy objects. You may not use painted metal. Remove paint from metal before bringing it to the playa. Avoid using aluminum. Even moderately high heat (~1200°F/650°C) will cause aluminum to melt. You can use nails, screws, or other steel fasteners in the construction of your installation. You are required to clean them from the burn site. A magnet rake is one of the greatest cleanup tools and can be purchased cheaply. When preparing to burn your piece remember not to use flammable liquids in such a way that they spill off of the platform and onto the playa surface. Avoid incorporating plastics and synthetics into your art installation. Any such items in your installation will need to be removed before it is burned. Clean up as quickly as possible, before participants pile garbage onto your burn. Steel containers (drums, garbage cans, large buckets) are much safer than plastic for removing ashes and debris. Plastic garbage can liners are not recommended. Please remember to check out with the ARTery after you have completed your cleanup so they may note that you have left your spot clean. IMPORTANT: If your art incorporates any kind of fire, it is mandatory that you have a burn scar protection plan and that you work with FAST to assist you. We are here to help! If you are creating burning art, you will be required to fill out the Fire Safety section of the participation form and include your burn scar protection plan. To be prepared to fill out the participation forms, please read all the relevant guidelines under our Fire Art Guidelines page.